No, not Holland, as in Europe. We're going on a three day bus tour to the cities of Holland & Grand Rapids, Michigan for the 85th anniversary of the annual tulip festival. If you enjoy outdoor gardens, flowers, tulips & gourmet foods then this is the trip for you. We will be spending time in Grand Rapids, MI and Holland, MI. We leave on Friday morning May 2nd and return on Sunday night, May 4th. All of the following are included in the tour price. 3-day trip to Grand Rapids & Holland, Michigan. Two nights hotel accommodation in Grand Rapids. at the Prince Hotel & Conference Center, the #1 rated hotel in Grand Rapids according to Trip Advisor. Two breakfasts and two lunches. 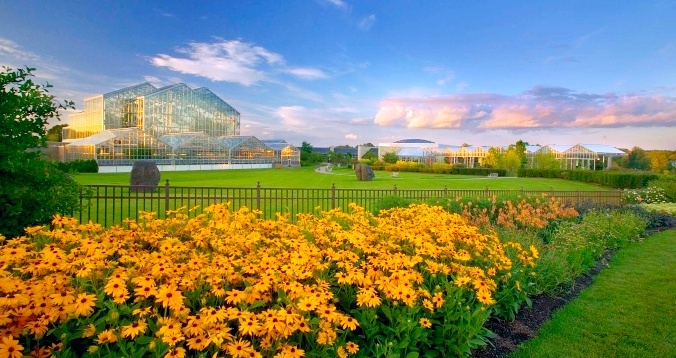 Admission to Frederik Meijer Gardens & Sculpture Park. 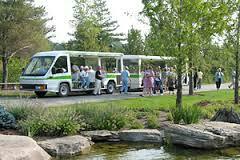 Indoor guided tour and outdoor narrated tram tour at the Gardens. Visit to the Downtown Market with a large selection of organic and gourmet foods. 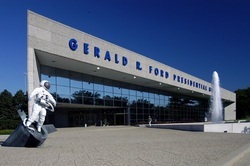 Admission and self-guided tour of the Gerald R Ford Presidential Museum. Admission and scavenger hunt at the Grand Rapids Public Museum. Prizes given to teams who find the most items in the museum. Carousel ride on an authentic 1928 Spillman Carousel, one of only three working units still in existence! Guided bus tour of Holland, Michigan with a tour guide in period Dutch costume. Admission to Windmill Island Gardens and chance to get up close with a real working windmill. Visit to the Historic Dutch Trade Fair. Dutch buffet lunch at The Queen's Inn Restaurant in Holland, MI. Complimentary bottled water, juices and snacks during bus journey. Are you travelling by yourself? If you are willing to share your room with one other person of the same gender, we guarantee to find you a roommate or we pay the surcharge! 100% full refund if you cancel 14 days before the trip departure date. We will start with an indoor guided tour including the Lena Meijer Tropical Conservatory, a five-story, 15,000 square-foot facility featuring rock landscapes, a waterfall and a variety of exotic plant selections. The conservatory houses tropical plants from around the world, including fig trees from India, exotic orchids from Central and South America, Asiatic bamboo and banana trees. Also included on the indoor tour will be the Carnivorous Plant House, the Arid Garden (featuring Saguaro cacti) and the Victorian Garden. After our indoor tour you will get a chance to rest your tired legs as we will all get to tour the park on a motorized tram while a tour guide provides a narrated commentary of the park and the extensive sculpture collection. If you were alive in the mid '70s, you will remember the Watergate Scandal and following the departure of Richard Nixon, Gerald Ford became President of the United States. The Gerald R Ford Museum is in Grand Rapids and we will have an opportunity to visit the musuem and learn more about the 38th President of the USA and the Watergate scandal amongst other exhibits. The Grand Rapids Downtown Market is a high-end gourmet market filled with numerous artisanal vendors including gourmet tea and spices, imported and domestic cheeses and charcuterie, coffee and tea beveragesand amazing artisanal breads, croissants & wood-fired pizzas. On Saturdays, also the day of our visit, there is an adjoining outdoor farmers market if you feel like browsing outdoors. Here's a tip - the butter croissants and chocolates are spectacular. I challenge you to leave this market without buying something.... it's virtually impossible! The Grand Rapids Public Museum is a fascinating and wonderful museum with an unusual method of organization.... the exhibits run alphabetically from A - Z. We will be taking part in a fun scavenger hunt at the museum. You will break up into teams of two to four people and go through the museum, hunting for 26 items, one in each letter of the alphabet. There will be prizes for the winning teams! Towards the end of our visit, you will get to take a trip back to your younger days and have a ride on the museum's 1928 Spillman Carousel. 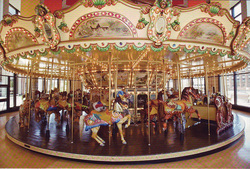 Manufactured by the Spillman Engineering Company of North Tonawanda, New York in 1928, the carousel is one of only three of its style known to have been produced by the company. The carousel is made up of forty-four hand-carved, elaborately jeweled wooden horses, two chariots and six menagerie animals and revolves to the music of a Wurlitzer band organ. 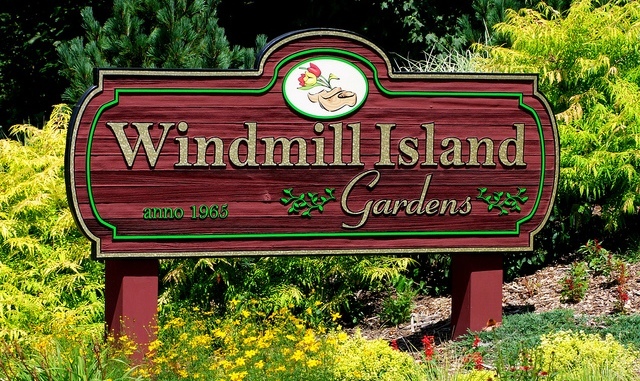 Windmill Island Gardens is a 36 acre heritage park filled with manicured flower gardens and Dutch architecture. In May the park comes to life with 175,000 tulips, for the annual tulip festival. Highlights include an authentic Dutch windmill, DeZwaan, dating to the 1760's and brought from the Netherlands in 1964. Standing 125 feet tall, the windmill is a symbol of the Dutch heritage of this area and is the only original Dutch windmill exported to America. It is still a working windmill producing stone ground flour for sale. 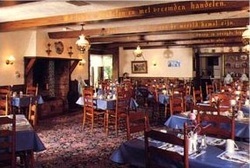 Our final stop before we head back to Toronto will be a traditional Dutch buffet lunch at the Queen's Inn Restaurant in Holland. This Dutch buffet experience is included as part of your tour price. We will have 5 pickup locations in the Toronto area. Pickups are also available along Hwy 401 between Kitchener & London if requested. We leave Toronto on Friday morning at approximately 8:00 AM. Actual pickup times vary by stop and will be sent out in the final email to all registered attendees, 2 days before the trip.